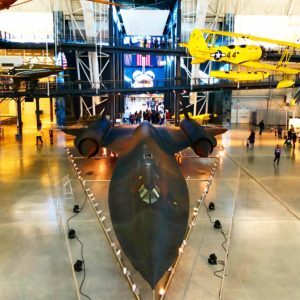 The Udvar-Hazy Center is located close to Dulles International Airport in Chantilly, Virginia. The Center was born out of a need for a place to house and showcase the larger airplanes and space craft that would normally have been displayed in the Air & Space Museum in Washington D.C. Because of the size of these aircraft, they are not easily dissembled and moved through the city streets to get them to the museum in the National Mall. 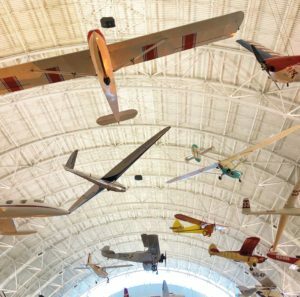 Instead, the museum directors searched for a place near the airport to build an annex to the Air & Space museum, and in the early 2000s the Udvar-Hazy Center opened as a companion facility to Air & Space. 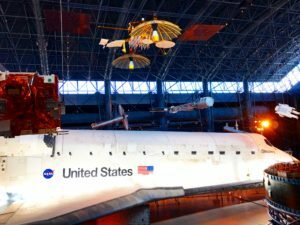 The Udvar-Hazy Center consists of two large hangers that display impressive and massive (these words don’t seem strong enough for what these air and spacecraft really look like in person) airplanes and the Space Shuttle Discovery. Yes, you can see a full space shuttle. It’s pretty amazing to see up close. My daughter had an audible gasp when she first saw it. Admission to the Center is free, but there is a $15 parking fee to enter the parking lot. Upon entering, there is a bag check. There is also a full McDonalds on site, however that is the only option for food. We spent approximately three hours exploring the hangers, but if your child is more interested in the details of each plane, it can easily be a longer visit. The Center is extremely stroller friendly. While there are several levels of the hanger to explore, there are elevators and ramps in convenient locations. To view the airplanes hanging from the ceiling of the hanger, there are high viewing ramps that my kids loved. For interactive experiences, there are three types of virtual reality simulators to try. My three-year-old daughter went on the gentler of the three simulators (another one actually goes upside down!). She liked it, but said it was a little scary. My seven-year-old went on the one that goes upside down, and she loved it. Each simulator has an additional cost. There is also a small plane which kids can sit in and learn how to steer, but that experience was closed on the day we visited. Upon arrival, the first aircraft that sets the stage for the rest of the display is the Lockheed SR-71 Blackbird. It is massive and so sleek and stealth. A photo is the best way to do it justice rather than continuing to describe it with using my tiny bit of knowledge of aircraft. You really must see it in person to get the full effect. Of course, the Space Shuttle Discovery is amazing in person. Beside the shuttle is a video of its last launch, which is educational and enlightening to watch when you are standing beside the space shuttle that is in the video. There are several other large aircraft to see and much history to read and learn. Another massive and impressive plane is the Concorde which is the supersonic passenger airliner that operated for over 25 years. It took passengers across the Atlantic in 3.5 hours. 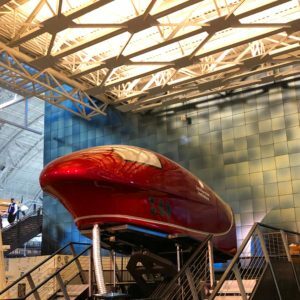 There is so much to see an explore at the Udvar-Hazy Center, and it’s very easy to get to if you’re in the D.C. area. Since the hangers house so many aircraft, they are quite long to walk from end to end. If your child uses a stroller for long walks, definitely take one for this adventure. McDonalds is the only food onsite, so eat before you go if you don’t like McDonalds. While it’s easy to miss while you’re in the hanger, make sure to visit the observation tower to watch flights take off from Dulles.